University Press of Mississippi, 9781604739701, 293pp. 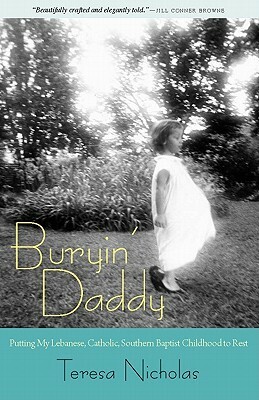 A descendant of Lebanese Catholic immigrants on her father's side and Baptist sharecroppers on her mother's, Teresa Nicholas recounts in Buryin' Daddy a southern upbringing with an unusual inflection. As the book opens, the author recalls her charmed early childhood in the late 1950s, when she and her family live with her grandparents in a graceful old bungalow in Yazoo City, Mississippi. But when the author is five, her eccentric father-secretive, penurious, autocratic, hoarding-moves his growing family into a condemned duplex nearby. Separated from her beloved grandmother and chafing under her father's erratic discipline, the girl longs to flee from the awful decrepit house. When she's a teenager, she and her father find themselves on conflicting sides of the civil rights movement and their arguments grow more painful, until a scholarship to a northeastern college provides the means of her escape. Two decades later, Nicholas has built a successful career in book publishing in New York. When her father dies suddenly, she returns to Mississippi for the funeral and to spend a month in the hated duplex as her mother comes to terms with her husband's passing. But as she sorts through the strange detritus of her father's life, the author comes to understand that he was far more complex than the angry man she thought she knew. And as she draws closer to her surprisingly resilient mother, affected by stroke but full of blunt country talk, she finds that her mother is also far from the na ve, helpless creature she remembers. Through a series of surprising and oddly humorous discoveries, the author and her mother will begin to unravel her father's poignant secrets together in this graceful and generous exploration of the intermingling of shame and love that lie at the heart of family life.